Quartet Records, in collaboration with Paramount Pictures, is pleased to present the score for The Amorous Adventures Of Moll Flanders for the first time ever on CD, sourced from the first generation master tapes used for the long out-of print RCA album. The LP assembly was created by John Addison himself with his usual good taste—and includes music that was not heard in the film. The package includes a 16-page booklet, generously illustrated with film stills, with notes on the film and score by Frank K. DeWald. Although the film is not especially well-known, Addison’s music is sure to delight fans of delectable melody and spirited comedy –whether they’ve seen the picture or not. Get to know Moll Flanders– she will capture your heart from first measure to last. 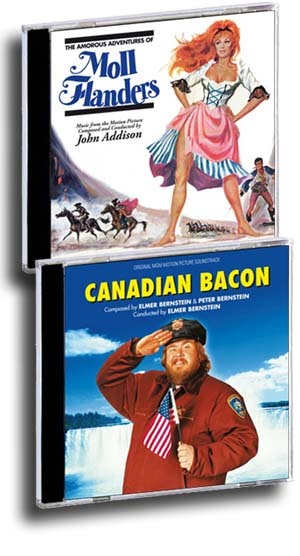 Quartet Records is also pleased to present the world premiere release of a powerful, hilarious score co-composed by Elmer and Peter Bernstein for the 1995 MGM comedy Canadian Bacon, an anti-militarist farce. The Bernsteins provided a bombastic, militaristic score, full of leitmotivs, hymns and lots of action music. Canadian Bacon is one of Elmer Bernstein’s great achievements of the ’90s, sadly forgotten due to the failure of the film at the box office. It is music deserving of rediscovery. The music, conducted by Elmer Bernstein, was recorded at Angel Studios in London. The package includes a 12-page full color booklet with liner notes by Randall D. Larson. A treat for all Bernstein fans!